Trophy wife – what’s your price? As if the whole “Spear saga” in all its circus-like complexity, the dramatic end of ET’s murder trial and the birth of a Quran-bearing Nigerian baby in a church was not enough to leave news-reading audiences around the world reeling this past week, that damn Samantha Brick, part-time Daily Mail columnist and full time troll, had to go and do it again. Yup, that’s right, she had to go and alienate open-minded, intelligent women everywhere with another delivery of her tragically truthful two cents. Not sure what I’m on about? Let’s just recap. The woman rose to notoriety earlier this year after she wrote an ill-considered column about what a tough life pretty girls, such as herself, have, because other women hate them. What with men offering you champagne on any off chance, buying you train tickets because you have such a pretty face, getting random bunches of flowers on the street, and your friends not wanting you to be their bridesmaid because you’re just too darn hot, I can totally see where she’s coming from. To make matters worse, the full-length photograph that accompanied the column revealed, not the Victoria’s Secret model-type everyone expected, but instead a rather demure-looking, average size, average height, blondish, prettyish woman somewhere between 28 and 40 (really can’t tell). Of course there’s nothing wrong with any of this – I’m a firm believer in the fact that each and every woman is beautiful in her own right. Her ‘average looks’ did not, however, seem to sit well with most readers and the poor lass got lambasted with the worst sorts of insults. Rather sad, I thought, as confidence is always an attractive trait in a woman and should be nurtured as such. However, once it starts flowing over into vanity, well, then, I guess, it’s a different story. After all of this I was pretty certain she would just disappear, let the earth swallow her for a little while and then, once she had licked those ugly welts, pop up incognito somewhere far away from the cold blue glare of computer screens. But no. No, she didn’t. Well not the popping up incognito bit, anyway, as a brand new, gasp-drawing, cringe-worthy column appeared on Monday. Now, what bugged me most about this unempowering opinion of hers was not the fact that she had given up her career aspirations to become some older, douche-sounding man’s life-long, till death do they part, arm candy, nor the fact that she has to consult him before every trip to the hairdresser or that he prefers her to wear classic, lady-like attire and to weigh 10 ½ stone. Also not the fact that she seems to be shallower than a saucer, nor that she didn’t even bother to pull in her tummy on one of the photos embedded in the column. What bothered me most of all was the fact that she seems to have lost that wonderful sense of entitlement she once oozed, back when she was just a pretty girl, and not a trophy wife. Why do I say this? Well, she proudly proclaims that her master husband holds all the artistic sway in their relationship, approving and disproving her looks at a whim and here’s the clincher… provides her with a 250 pound a month allowance to spend on her wardrobe. 250 pounds. Okay. Sounds pretty decent. In our terms that would be about R3250. Just to spend on clothes! For an ordinary girl like me, whose livelihood doesn’t depend on the impeccable art of impressing with appearances, that’s AWESOME! What a treat! Just a quick squizz through the 36Bouthiques website revealed that she’d be able to afford 1x pair of Daniella Michelle boots @ R1599, 1x Jo Borket Python Clutch @ R990 and 1x Adam & Eve 100% Linen Dress @R480… then she only has R181 left for accessories. And what if she wanted to buy these Luiza Barcelos leather peep-toe high heels @ R3499? She’d have to coax more pounds from her hubby! And what about her make-up and toiletries? Gym contract? Botox? Does she get a separate allowance for each? Nope, I’m sorry, man! If you’re going to keep a trophy wife, at least make it worth her while, you know! And, woman, if you’re going to BE a trophy wife, make damn sure the perks solidly make up for what you’ve given up. Which means, Samantha Brick, you’re doing it wrong! Giving up a successful career, independence, fun, flirts and excitement for a controlling man and 250 pounds a month doesn’t sound like a deal to me. How about you? 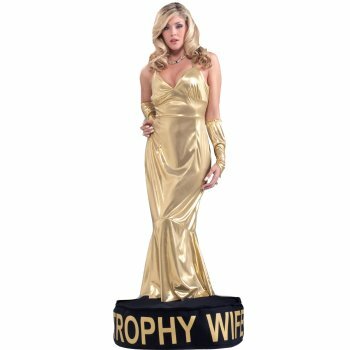 What would your Trophy Wife price be? Oh.my.goodness. Disgusting. No woman should get an ‘allowance’ from her husband, nor a man from a woman. Weird how some people thrive for this type of relationship. “…but if you are saying your milkshake brings all the boys to the yard, you can’t serve up Nesquick hoping to prove it, right?” – My favourite line! o i love this! so well written Nadi! hehe!